This quilt is from our book, Aunt Millie’s Garden, which is available as an eBook. Click here to find it at pieceocake.com. 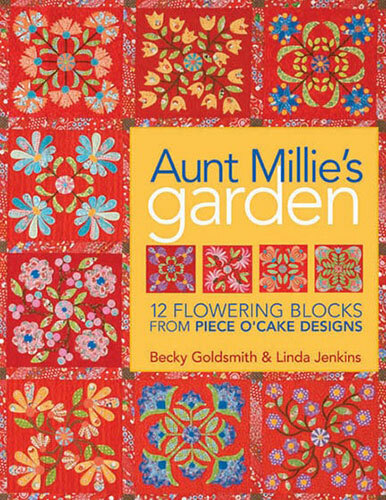 Aunt Millie’s Garden from the book Applique Delights by Becky Goldsmith & Linda Jenkins. Quilt by Linda Jenkins, quilted by Mary Covey. Aunt Millie’s Patio Garden made with blocks from the book Applique Delights by Becky Goldsmith & Linda Jenkins. Quilt by Becky Goldsmith. Linda quilted that quilt and I don’t really know the details. I know that we both normally quilt with matching thread, top and bobbin. Usually a 2-ply cotton thread like Aurifil or a 3-ply like Masterpiece off of the cone or spool. We quilt in the ditch around all the appliqué, we quilt inside the appliqué, and we fill the background with something that is not overpowering.